This year’s GDR has been going for just over 24 hours now and thanks to Jill Homer (of Up In Alaska cycling blog fame) the coverage is better than ever before. While Jill has a vested interest in the event since her boyfriend, Geoff Roes, is participating this year she’s already gone above and beyond the call of duty tracking down a bunch of interesting links and info on most of the GDR 2008 participants. It’s really cool to be able to find out a little more about the roughly 20 participants that are giving the race their best shot this year. So far it looks like David Blaine and Geoff Roes (the two guys I knew a little bit about from their blogs going into the race) are right at the front of the pack heading into Lincoln, MT. Considering David’s on a single speed that’s particularly impressive. 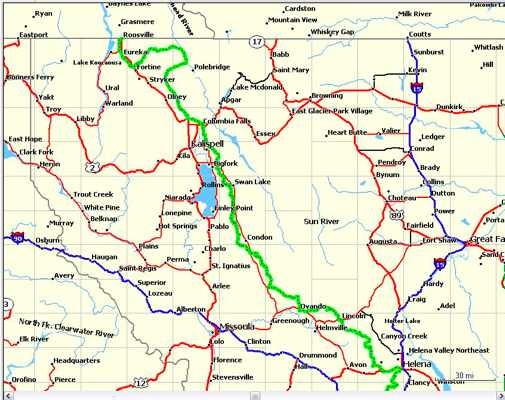 Based on their Spot Trackers it looks like David chose to stop over in Seeley Lake earlier tonight while Geoff pressed on towards Lincoln and stopped a little ways outside Ovando, MT. After checking the doppler radar for western Montana tonight it looks like some heavy rains and thunderstorms are passing through the race area. It will be interesting to see what kind of impact that has on the riders and hopefully everybody in the race has sufficient shelter from the elements tonight. The weather report for tomorrow in Helena seems to point towards some rain and an additional chance of thunderstorms in the afternoon so that could make for some sloppy and unfriendly riding conditions as the riders advance.